Although I have produced three live action shorts and two feature films, this is my first documentary, and my first project as a director. Like many first-time documentary filmmakers, I became involved because it was a project that cried out for documentation. The Art of Remembering began as an exhibition of hand-carved memorials set in the historic gardens of Blickling Hall, a Jacobean palace in Norfolk, England, now owned by Britain’s National Trust. In the 17th century it was the home of the Boleyn family, and it is said that Anne Boleyn, Henry VIII’s second queen, was born there. The Art of Remembering exhibition consisted of works by 54 of Britain’s finest letter-cutters who explored the themes of memory and loss. It was a huge success and admissions exceeded all expectations. Many visitors said that the memorials with their poetic inscriptions had provided a rare (and welcome!) opportunity to connect with their feelings about death. Others had found inspiration and comfort. One couple wrote: “...Death can be tragic (we have lost a baby son, stillborn) but ultimately there is great hope. The stillness and beauty of the artwork here today reinforces that. Thank you for organizing this.” Letters like this convinced me that a documentary about the exhibition could be a source of help and inspiration to many people. From the outset, I had wanted to make a video of the project. I wanted it to include interviews with some of the artists and shots of the exhibition works in progress, to demonstrate how letters and images are designed and carved. The estimated cost was £50,000, and my attempts to raise funding soon showed that the chances of an independent filmmaker getting a one-off documentary made by any of the UK television stations are virtually nil, let alone one about memorials. Those executives with whom I was able to discuss the project were full of warnings about memorials being a turn-off for audiences. It seemed that the association with death was the main problem. Yet, television constantly besieges us with images of death, feeding our fear of it and divorcing it from life, thus making life less real. Memorials, by contrast, help us to live with death as part of life. As such, they are a force for wholeness and liberation. On reflection, it seemed to me that the problem was not death itself, but the fact that memorials offer no scope for sensationalizing it. Whatever the reason, it proved impossible to raise the money. Meanwhile, the exhibition was due to close, and the memorials were about to be removed from their beautiful landscape setting. So a friend, John Fitzmaurice, and I decided to rent a video camera and shoot the memorials ourselves. Even if we could not raise the money to edit the footage, at least there would be a video record of all the exhibits. A filmmaker friend, Ron Peck, recommended using the Betacam SX and his company, Team Pictures, agreed to rent one to us at a much-reduced rate. The Memorial Arts Charity kindly offered to pay for the camera rental and expenses. So, one icy, blue autumn dawn, we found ourselves at Blickling at the start of a three-day shoot. The gardens and park are spread over several acres, partly formal and partly wild. One of the delights of the exhibition was that the memorials were scattered here and there among the ancient trees and woodland, some almost hidden in dells and glades, like a treasure hunt. We borrowed a wheelbarrow from the gardeners to cart the equipment around. Wheeling it from one exhibit to the next across uneven terrain was not easy. Furthermore, the exhibits all faced in different directions so that the memorial nearest to the one we had just shot was often in shadow and therefore could not be filmed consecutively. To cap it all, the light was constantly changing: in this one weekend we experienced the whole gamut of British weather from benign sunshine, to violent thunderstorms, with hail, sleet, drizzle and relentless rain. Fortunately, we had done a trial shoot the previous weekend with a Hi-8 camera to plan the optimum times of day for shooting each piece. As it turned out, the weather on the weekend of our actual shoot was so capricious that we were unable to stick to, or complete, our schedule. Luckily, we were able to use some of the trial Hi-8 footage as cover for shots, which were unusable due to condensation, lack of light and other problems. On returning to London we had all the material, including the Hi-8 footage from the trial shoot, transferred to VHS. We logged all the footage and did a paper edit. We had the Hi-8 material digitized and did a rough assembly using the best of both sources. The director and trustees of the Memorial Arts Charity loved the assembly and asked me to budget for completing the film. This came to £15,000, which was more than they were able to commit at the time, so the project went on hold. Meanwhile, I had sent a cassette of the assembly to a US distributor. His reaction was extremely positive, and this encouraged me to try to complete the project. I eventually found a filmmaker/ editor, Robin Mahoney, who agreed to edit the project in his spare time for a low rate. He also managed to get down time on various Avid machines (Final Cut Pro was not yet available). Bit by bit, we completed the edit. The next stage was to create a commentary. The great thing about memorials is that they are a meeting point for so many areas of life. I wanted someone who could bring this out. I had once attended a thrilling lecture in Oxford by Professor Ewan Clayton with the title “Lettering and Calligraphy in the Digital Age.” As well as being one of the finest living calligraphers, Ewan is a consultant to the Palo Alto Research Center (PARC) of the Xerox Corporation with a special interest in the document. Since memorials are, as much as anything, documents, I dared to hope that Ewan would be interested. I sent him the rough cut and, to my great joy, he agreed to do the commentary. I wanted it to have a spontaneous, “off the cuff” feel, so I asked Ewan to watch the movie and respond aloud to the images as he viewed them. We did three takes in this way and used the best sections from each. This was made possible with the generous help of composer Simon Brint, who edited the commentary and composed the music, donating his time and equipment. Simon is one of the top composers in UK television and had previously composed the music for my film A Shocking Accident. My dream of having the main title, The Art of Remembering, carved by hand from a piece of Welsh slate could not be realized this time around. Instead, we used the title logo from The Art of Remembering book, designed by Stephen Raw. For the captions, we used a typeface, “Strayhorn” designed by letter-cutter Michael Harvey. All in all, we ended up spending just £12,500 in hard costs—£6,500 of which was raised from two charitable foundations, while the remaining £6,000 came from The Memorial Arts Charity. The film could not have been completed without a further £12,500 in the form of reduced or donated services and facilities, bringing the real cost to £25,000. This movie would not have been possible without the unwavering support of Harriet Frazer, founder of Memorials by Artists, and Director of The Memorial Arts Charity. In July 2001, when the movie was finally completed, I sent a cassette to the US distributor who had encouraged me from the start. A few days later, I received an e-mail from him saying that he loved the movie and would like to take it for distribution in North America. This was a very proud moment! Our hope is that this film will encourage more people to engage in the art of remembering. So many of our older churchyards stand eloquent with lovingly shaped and unique memorials. 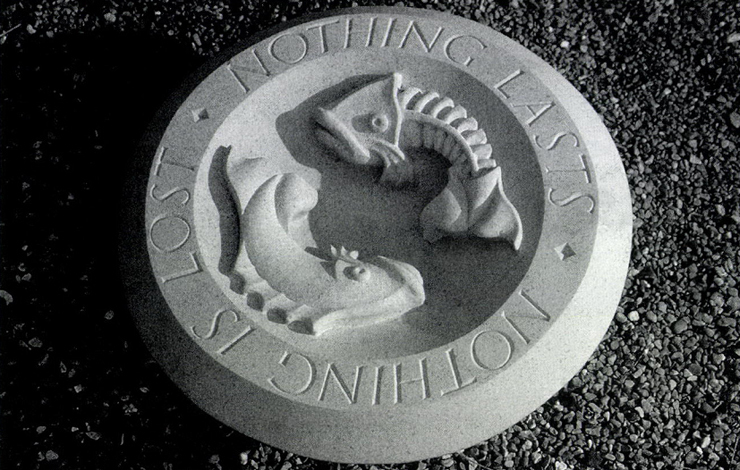 Once people have seen what is possible in terms of hand-carved memorials today, maybe they, too, will be inspired to explore an enlivening alternative to the ready-made and mass-produced. I would love for them to discover for themselves the benefit and comfort that working with an artist can bring. Perhaps also there are some who will recognize this work as theirs; listening to those who grieve, they may pick up their carving tools and respond. London-based filmmaker Christine Oestreicher produced the Oscar®-winning short, A Shocking Accident (dir. James Scott, 1983) and received Oscar® nominations for two additional short films and British Academy of Film and Television nominations for two feature films. She helped organize The Memorial Arts Charity and co-curated The Art of Remembering exhibition.